The buzz around pay equity is showing no signs of letting up. In this free webinar entitled “Pay Equity Update: Do Your Pay Practices Make “Cents” In Today’s Environment,” Lynn Clements, Berkshire’s Director of Regulatory Affairs, will review state and local salary history bans and discuss pay equity laws. Lynn will also give attendees helpful tactics on how to approach pay equity within their organization. Subscribe to our blog to receive updates on upcoming webinars like this one and compliance updates straight to your inbox. 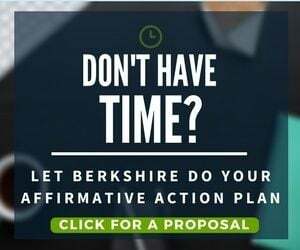 If you need assistance with affirmative action plan compliance, contact us at 800.882.8904 or bai@berkshireassociates.com.